In many parts of the country, climate change may slip into the back of our mind as we go about our lives. In Alaska, climate change is impossible to ignore. With rapidly increasing temperatures, thawing permafrost, changes in precipitation and weather patterns, melting glaciers and subsequent sea level rise, many people in Alaska see reminders of climate change in their daily lives. 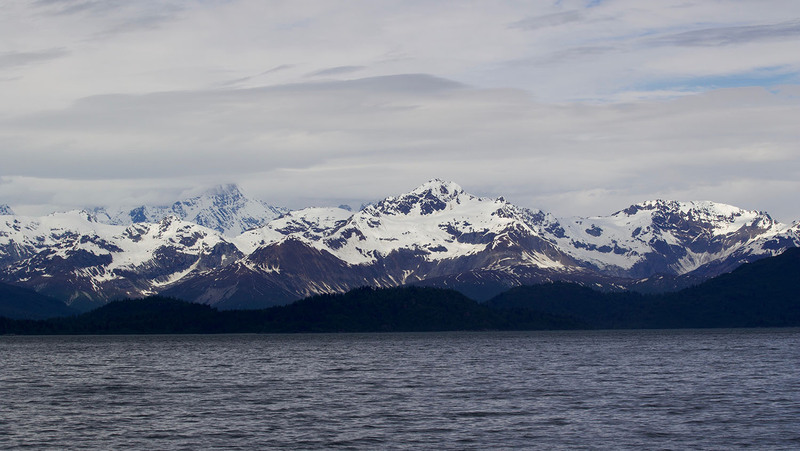 Pictured above are mountains near Glacier Bay National Park, just one area seeing rapid change. But climate change isn’t just seen – it’s felt. Weather and temperature fluctuations aside, many experience the less obvious but no less concerning health impacts caused or exacerbated by climate change. Taking note of how climate change has already affected the health of Alaskans, and how it may in the future, is important to mitigate and adapt to our changing world for a healthier future. Here are some ways that the health of Alaska residents may be impacted by climate change. According to NPR, approximately 90% of Alaska’s residents live in coastal areas, such as those pictured along the coastline in southeastern Alaska. Quickly rising water levels and erosion threaten infrastructure to many Alaskan’s homes and communities, which can cause chronic, long-term stress. Stress not only predisposes individuals to be more vulnerable to illness, but may also lead to or exacerbate mental health issues, such as depression and anxiety. Alaska already has higher rates of mental illness compared to the rest of the country. Such ailments can impair social, professional, and cognitive function; thus, mental health impacts of climate change are of great concern. Many people in Alaska use land and sustenance food resources (such as wild fish, eggs, and berries) to sustain themselves. As temperatures change landscape, growing seasons, and wildlife populations, these people may face food shortages and subsequent malnutrition. While some crops are experiencing longer growing seasons which may be beneficial in some areas, invasive species may also increase, threatening future or other crops. To further complicate the equation, average annual precipitation is expected to increased by 15-30% by 2100 compared to a reference period of 1971-1999, which may greatly impact food plant growth, and make harvest more difficult. Climate change has already increased variability in berry harvest, such as the native berries pictured here. Furthermore, shifts in caribou migration, and warmer oceans, are leading to decreases in some seafood availability. Native Alaskans, who also use seals and collect eggs in lush wildlife areas such as the island pictured below, may be forced to adapt to find new sources of food. Seafood safety is also impacted by climate change. Rising temperatures promote harmful algae bloom in fresh and saltwater. In the right conditions, marine toxins produced by algae may accumulate in mollusks such as clams and scallops, which can lead to increased risk of paralytic shellfish poisoning. Many communities, such as Sitka, pictured here, have already experienced harmful algae blooms, and rely heavily on fishing for income and as a major source of food. Furthermore, fishing plays an important role in the economy of many Alaskan communities, such as Petersburg, seen below. Disruptions to profitable seafood supply may have a negative economic impact on many vulnerable people, further increasing their risk to physical and mental illness. Tourism plays a large role in Alaska’s economy, and may be impacted by climate change. As sea ice continues to melt at a rapid rate, marine traffic may increase, including traffic related to tourism, as with the ships and zodiacs seen here near Fort Terror and Lake Eva. This may increase carbon emissions in the air, and cause respiratory and cardiovascular illness. On the other hand, increased tourism may be beneficial to tourism-driven towns, and the increase in income may help some Alaskans better defend themselves against climate change. With changing temperatures and precipitation patterns, outdoor recreation activities (such as hiking, running, rock climbing, kayaking as seen here at Fox Creek, and other water sports), which may offer both physical and mental benefit for Alaskans, may change. These changes may help or hinder opportunities for recreation, depending on the activity. The average temperature across Alaska has increased approximately 3 degrees Fahrenheit in the past 60 years, more than double the average of the rest of the United States. Rising temperatures comes and unseasonably warm weather as seen in here in Sitkoh Bay, ushers increased risk of heat stress, illness, and stroke. While Alaska’s temperatures are not predicted to be as high as in some parts of the country, a lack of air conditioning or other climate control in many homes and buildings may increase risks of heat illness for some residents. Receding glaciers don’t just impact the water – they may also impact the air. Increased rates of glacier melting can lead to increased glacial dust being emitted into the air. This can increase rates of ambient PM levels, especially PM10. PM causes increased risk of many chronic cardiovascular and respiratory illnesses. Glaciers at Glacier Bay national park and Dawes Glacier, both pictured here, face global climate change. Glacier Bay, below, has already seen melting glaciers. While Dawes Glacier has not yet been well-studied. Additionally, climate change is increasing wildfires in Alaska due to increasing temperatures and changing precipitation patterns. Wildfires emit a mix of harmful pollutants including carbon monoxide, particulate matter (PM), and volatile organic compounds (VOCs), and heavy metals such as mercury. Exposure to wildfire smoke can lead to respiratory and cardiovascular illness, as well as asthma and low birth weight in offspring. And, as mentioned above, increased marine traffic may also contribute to increases in PM. Climate change is bringing warmer temperatures and changing weather patterns in Alaska. This can impact the incidence and spread of vector-borne illnesses by increasing the length of transmission season, and offering favorable climate to vector breeding. Flooding or heavier-than-usual precipitation may also lead to standing water, as seen in Petersburg, Alaska, thus greatly increasing risk of mosquito-borne illnesses, as such environment fosters favorable mosquito reproduction. Climate change can also increase risk of waterborne illnesses. Increased temperature can influence survival, virulence, and persistence of many pathogens in and outside of water. Floods and droughts may also increase availability of safe drinking water. Additionally, increased runoff and changes in precipitation may lead to increases in contaminated food and foodborne illness. Climate change affects many plants, and often impacts the abundance and seasonality of allergens. Increased temperatures in Alaska may lead to increased pollen and bloom, and allergens in the air, increasing or exacerbating allergies, hay fever, and asthma. Below, a plant pictured here near Pavlof Harbor, blooms abundantly, perhaps impacted by a changing climate. While the melting glaciers (as those see above, near Dawes Glacier) and warmer temperatures are more visible impacts of climate change being experienced by Alaskans, a variety of public health issues emerge in a more conspicuous – but no less concerning – manner. From changes in food metrics and safety to disease transmission, mental health risks and complicating one’s ability to access medical care, climate change is a threat to not only the health of the earth, but also to the health of the human. To move the planet forward, we need a healthy population. And for a healthy population, we rely on the earth. Addressing these public health issues in places where climate change is being felt more sharply than in other parts of the world can help us all work to not only reduce our climate impact, but also to better adapt and mitigate to our world as it changes.